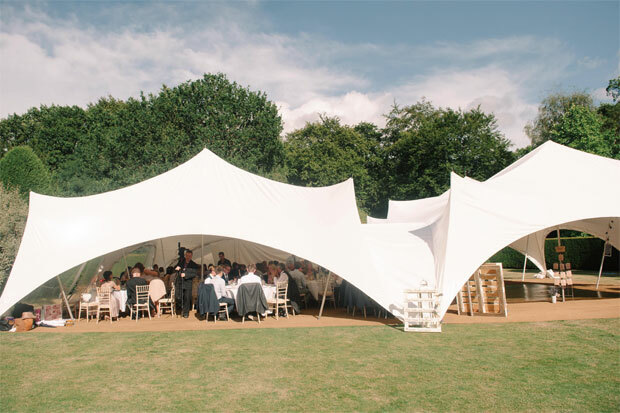 Our venue was my aunt and uncle's home – a house designed and built by Surrey architect Sir Edward Lutyens in 1890 – and it holds wonderful family memories. 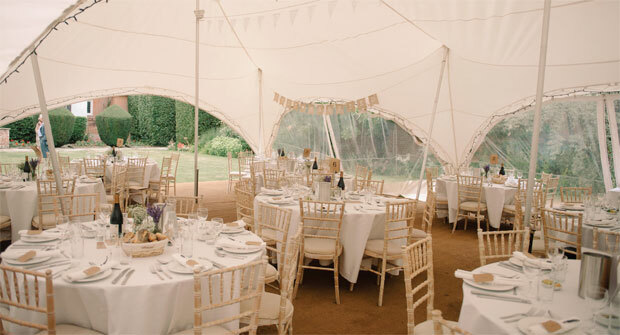 The lush green lawn is surrounded by colourful flowers, which were perfect for our theme. Our Lady Queen of Peace RC Church is in Richmond, where I grew up. It meant a lot to me to be married there as it's a beautiful little church. I wore a lace veil for the ceremony and swapped it for some vintage hair slides, which Aaron's mum had worn at her wedding, for our first dance. I tried on about 10 dresses in total, and my chosen gown was actually the first one I'd tried. I'm a big fan of the vintage look and knew I wanted a classic lace design. 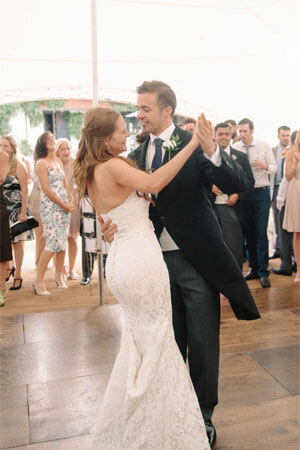 It was the only dress that made me cry when I had it on. 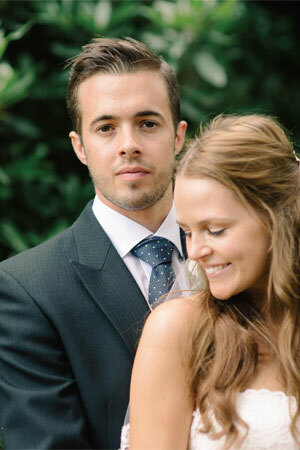 Aaron wore a traditional morning suit, with pinstripe trousers, waistcoat and jacket with tails. His best man was Alex, while Bradley, Mo and Scott were ushers. They all wore the same outfits, except Aaron had a blue tie and pocket square. 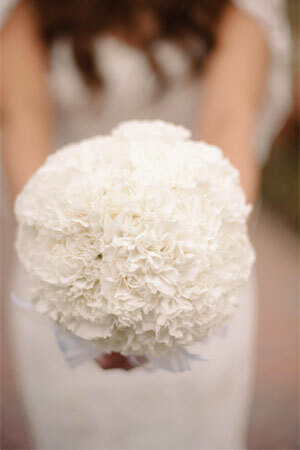 I carried a bouquet of white carnations while the bridesmaids had posies of gypsophila. I wanted a very rustic look, as if the flowers had just been picked. 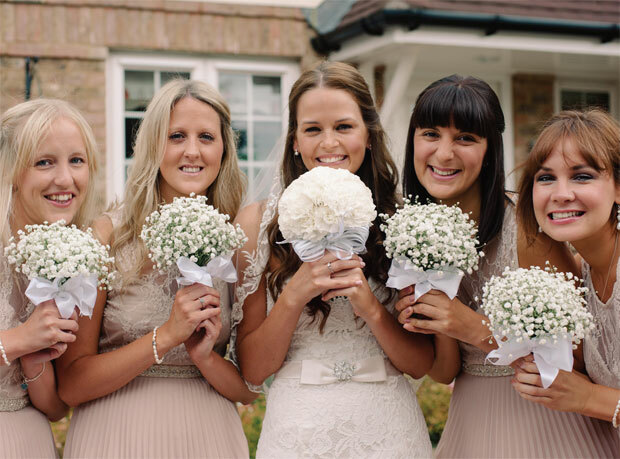 I had four bridesmaids who were all university friends, Casey, Helen, Louise and Nicola. They wore pretty, knee-length pink dresses which featured pleats in the skirts and lace tops. 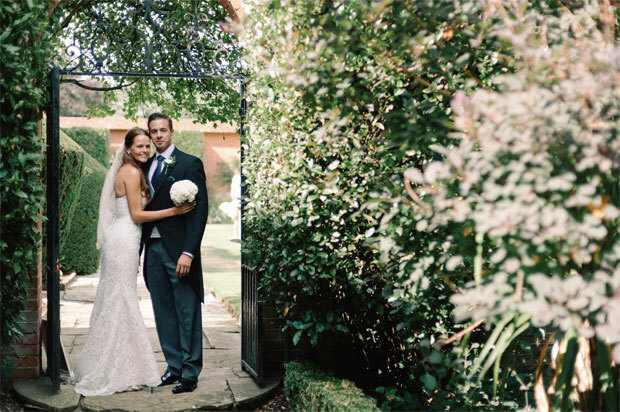 In all our decorations we used gypsophila for its wild flower look and lavender to continue the English garden theme. We got our beautiful blooms from Mayfield lavender fields in Banstead a few days before the wedding so it still had its amazing scent. 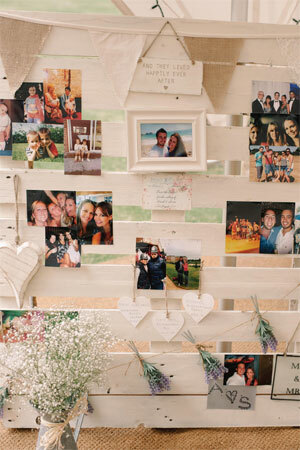 We used an old wooden pallet to display photos of us and our friends and family. It was a real talking point and people loved the creativity. Our reception was in two open Capri marquees. 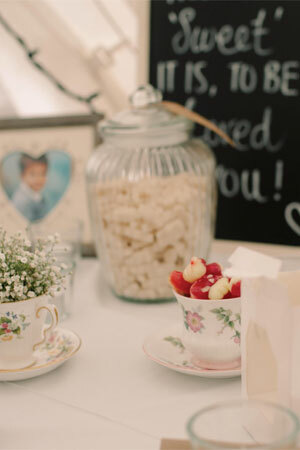 We used lace bunting and strings of lavender to decorate them, as well as flowers in jam jars. 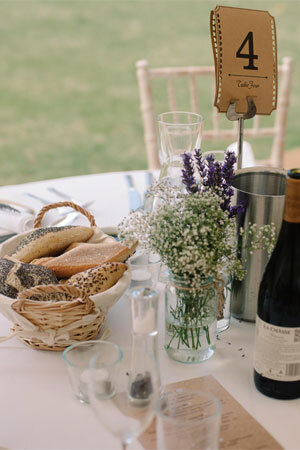 Our centrepieces were jam jars wrapped with twine, containing lavender and gypsophila. We used an old typewriting stamp to print guests names on brown luggage tags, which we wrapped in 'Mr and Mrs' printed ribbon. 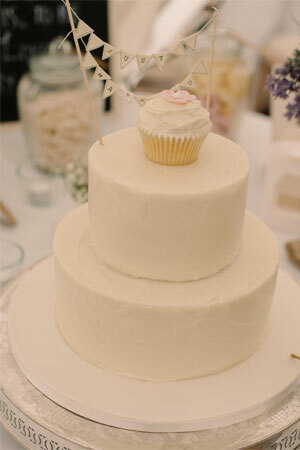 Our cake was made by Hannah Cuffe of Remember the Cake and was a tasty two-tiered buttercream design. The cake topper was a string of bunting saying Just Married. 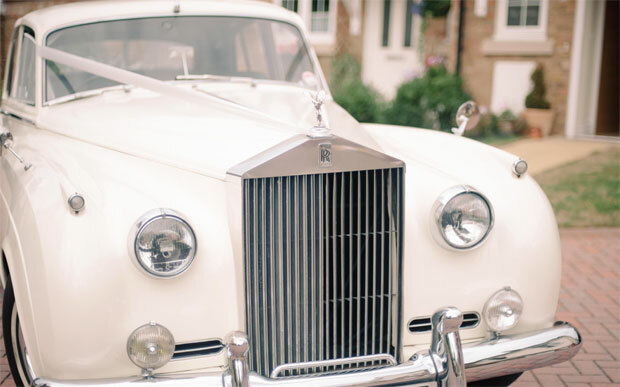 I travelled in a cream vintage 1959 Rolls-Royce Silver Cloud. I was with my dad, Brendan, on the way to the church, and then had some time with Aaron after the ceremony. 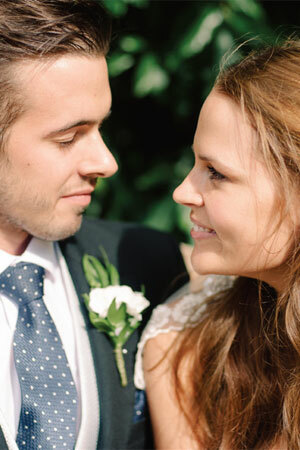 Aaron's cousin is a wonderful wedding photographer, so she was a natural choice. We had a string quartet at our champagne reception. It was lovely hearing the classical music playing while outside on the lawn. We bought white sky lanterns for all the guests to release in the evening – which we did while the theme music to the movie Up played in the background.